Copywriting for the first range of candles from leading florist and botanist Robbie Honey. Text for packaging in English and French, promotional materials and website. 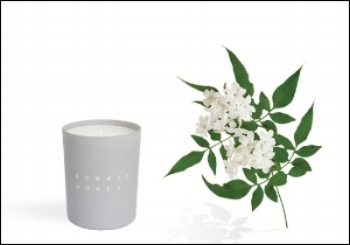 Read the candle descriptions and biography below or on the Robbie Honey website. A bouquet fashioned entirely from lily of the valley is one of the loveliest. Its essential clarity is captured here. This bright woodland flower is sent as a sign of regard on the first of May, heralding spring. In the throng of a distant island port at dusk, the sultry perfume of jasmine suffuses the air, and wild tendrils are fashioned into offerings. The heady scent mingles with the woody and vegetal aromas of this remote archipelago. On a midsummer’s day, walking in the Eastern Highlands of Zimbabwe, I found fields of white lilies, astonishing in their abundance and ravishing scent. Casa Blanca is the definitive classic white oriental lily. It was in a garden filled with night-blooming tuberose, that I first became hypnotised by their intoxicating fragrance. Cut after nightfall, their creamy petals exude an intense perfume; softened with sandalwood and amber.